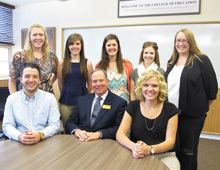 The University of Wyoming College of Education recently hosted 2016 recipients of the Lola B. Newcomb Beginning Teacher Support Grant during a day dedicated to sharing their insights and experiences as first-year teachers. Applications for the Newcomb Grant applications are available each fall through the Education Dean’s Office. The seven 2016 Newcomb Grant recipients are Jennifer Bennett, Rachel Howerton, Haley King, Bryce Mitteldstadt, Ashley Radoesevich, Laura Timm and Claire Wetzel. Jennifer Bennett teaches secondary English at Hanna-Elk Mountain Junior/Senior High School. Jennifer attended the National Council of Teachers of English Whole Language Umbrella Summer Institute with support from her Newcomb Grant. Attending the event provided the opportunity to deepen her knowledge about teaching English at all secondary levels, as well as ways to support students’ college and career readiness goals. Rachel Howerton teaches K-5 art at schools in Sheridan County School District 2. Last year, during her inaugural teaching year, she taught art in Riverton. Rachel used her Newcomb Grant to attend the National Council on Education for the Ceramic Arts conference in Kansas City. Attending that event exposed her to new methods for teaching students to utilize clay in her classroom, how to manage the classroom when using clay and related tools, and learn appropriate ceramic lessons for young students. Haley King teaches mathematics at Sheridan High School. She opened her teaching career last fall at Evanston High School. Haley used her Newcomb Grant to attend the National Council of Teachers of Mathematics annual meeting in San Francisco. Attending the conference gave Haley the opportunity to network with peers and discover new methods to keep students interested and engaged in learning mathematics. Bryce Mittelstadt teaches seventh grade social studies at CY Middle School in Casper. Bryce used funds from his Newcomb Grant to purchase materials supporting the common core, Wyoming and national standards in his content area – all designed to help his students succeed as learners. One of the outcomes of his grant was construction of two project-based units that emphasize experiential learning. Ashley Radosevich teaches kindergarten at St. Anthony’s Tri-Parish Catholic School in Casper. Ashley purchased manipulatives, dramatic play props, classroom materials and an egg incubator with her Newcomb Grant funds. The purchases expanded her ability to create social learning experiences for her young students – including the opportunity to watch a chick hatch during a special spring teaching unit. Laura Timm teaches third grade at Willow Creek Elementary in Fremont County District 25. Laura wanted to improve her students’ writing skills, so she used Newcomb funds to purchase several books for her class. Among the purchases were books on mentor texts as well as children’s books covering various reading levels and genres. Her goal was to help students connect writing and reading. Claire Wetzel teaches second grade at Saratoga Elementary School. Claire attended the Teton Science School’s Place-Based Education Workshop with part of her Newcomb funds. She also purchased professional development resources as well as books for her classroom library, manipulatives for her mathematics teaching, and supplemental curriculum resources. 2016 Newcomb Grant recipients wrapped up their day of visits meeting with Dean Ray Reutzel and associate deans Leslie Rush and Suzie Young. Seated (l-r) are Bryce Mittelstadt, Reutzel, Haley King. Standing (l-r) are Rachel Howerton, Laura Timm, Claire Weitzel, Ashley Radosevich and Jennifer Bennett.